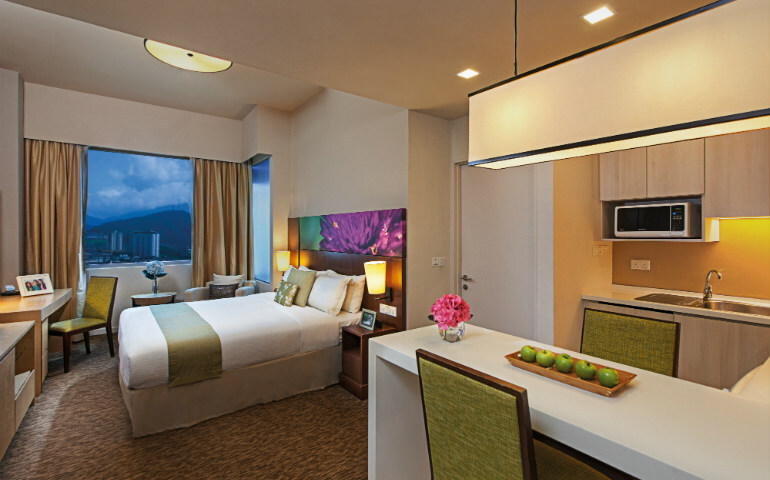 Contemporary serviced residences Somerset Ampang Kuala Lumpur is situated at the prestigious Embassy Row in Kuala Lumpur. This prime location is near the city’s business, shopping and entertainment district, and a short five-minute walk from the Ampang Park LRT station, which provides easy access to the rest of the city, including the shopping haven of Suria KLCC and the transportation hub, KL Sentral Station. Catering to both business and leisure travellers, Somerset Ampang offers 205 well-appointed residences comprising studio apartments as well as one-, two- and three-bedroom options. Each residence highlights comfort and convenience, and features a fully-equipped kitchen, separate living and dining areas, a modern home entertainment system, broadband internet access and more within a generous space. A range of amenities will make your stay at Somerset Ampang a pleasant one, and includes 24-hour reception and security surveillance, residents’ lounge and programmes, gym, rooftop infinity pool, daily housekeeping and more. Airport transfers and daily shuttle service to the LRT, selected shopping centres and the financial and civic districts make getting around easy. Families are very well taken care of here too with a children’s wading pool and babysitting services. Somerset Ampang is housed within an integrated development that’s also home to HSC Medical Centre, one of Malaysia’s leading medical, heart and diagnostics centre. Also, within the surrounding area are a number of embassies, offices and shopping centres, as well as gorgeous pre-war architecture, the National Art Gallery and Istana Budaya - Malaysia’s premier venue for cultural events and performances. Whether you’re in the city for a business meeting or a holiday, a stay here promises to leave you wanting for nothing. As Somerset Ampang is part of The Ascott Limited’s global collection of excellent serviced residences, you can expect great service and a luxuriously comfortable home away from home. For more information and enquiries, email enquiry.kualalumpur@the-ascott.com.